July has been a pretty busy month. I’ve been in six different states – mostly at all different times – and spent a good week and a half out of the office resting up for what will likely be a whirlwind fall. I took some time away from el blog too but have come back refreshed and ready to cook, eat and post. 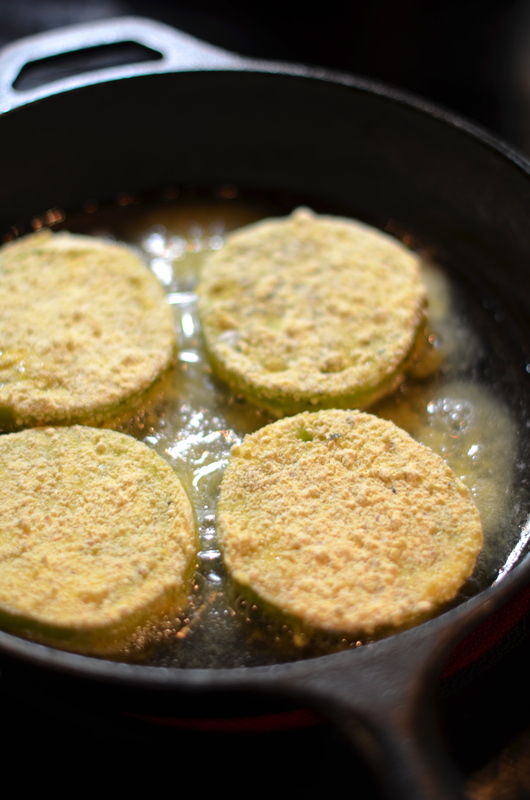 A few weeks back I had a hankering for some fried green tomatoes, and decided that if I could find them, I would make them. That same afternoon, I suppose my Southern was showing and I also cranked out some homemade biscuits, pimiento cheese and some fresh corn to go along with everything. 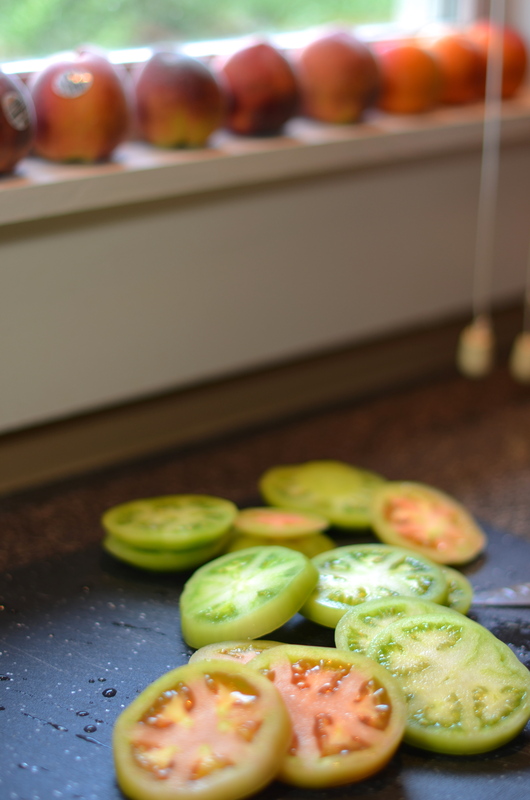 July is prime tomato time – red, yellow, purple and of course, green – and I’m already panicking that I’m not going to ingest enough maters and peaches to satisfy myself for the long winter. I still buy tomatoes year round, but we all know they don’t taste like anything in January. 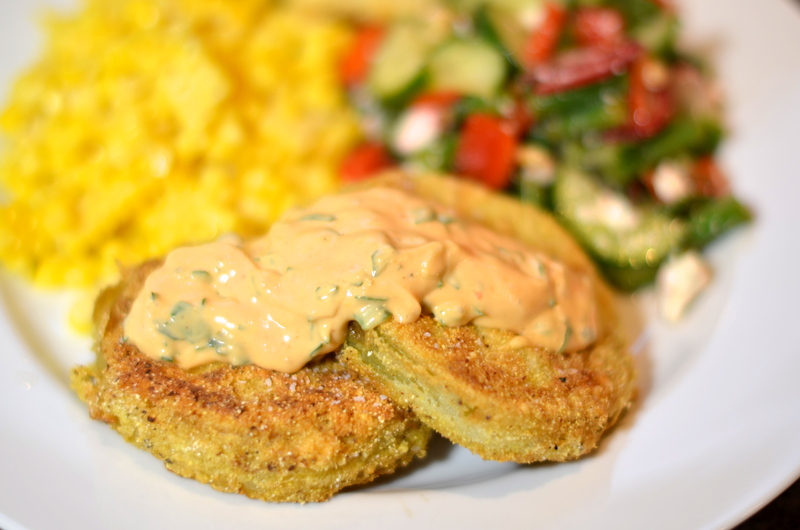 I hadn’t made fried green tomatoes before, so I did some looking around and found a handful of different recipes to get my juices flowing. Some called for buttermilk and flour, some suggested using panko. 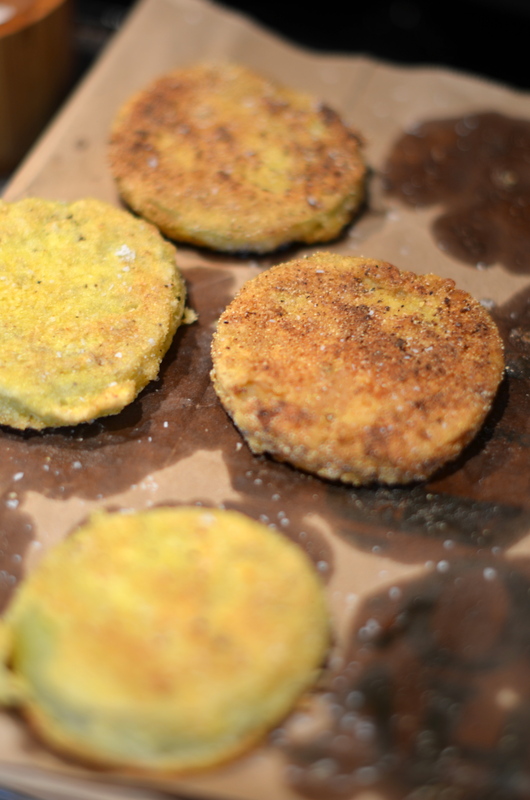 I decided that real fried green tomatoes should have a crispy golden cornmeal crust and so that’s what I decided to do via your good friend the three-step breading process. 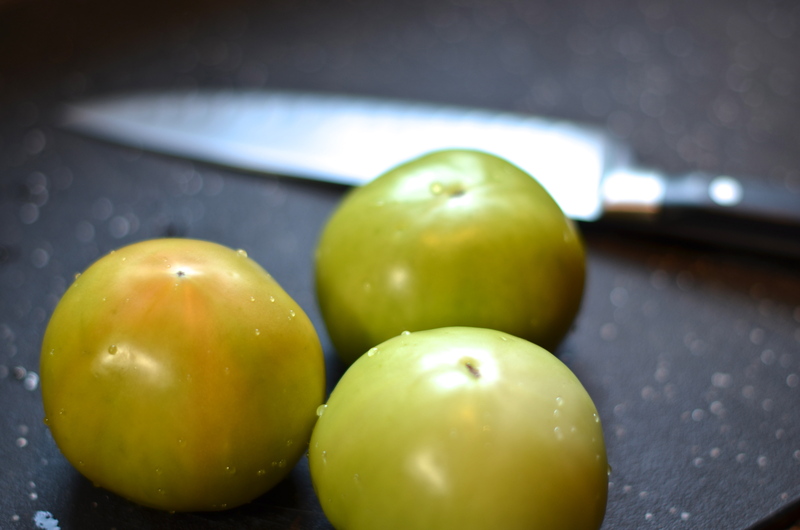 Slice your tomatoes rather thick – somewhere between 1/3″ and 1/2″ without really worrying about being precise at all. I let the pug eat the ends and kept the good slices. Get out three shallow dishes (I use pie plates or something along those lines) and put the flour, beaten eggs and cornmeal in their own special container. Season each with salt and pepper. Oh, and set out a brown paper bag or paper towels on a cooling rack so you can de-grease your tomatoes after you fry them. 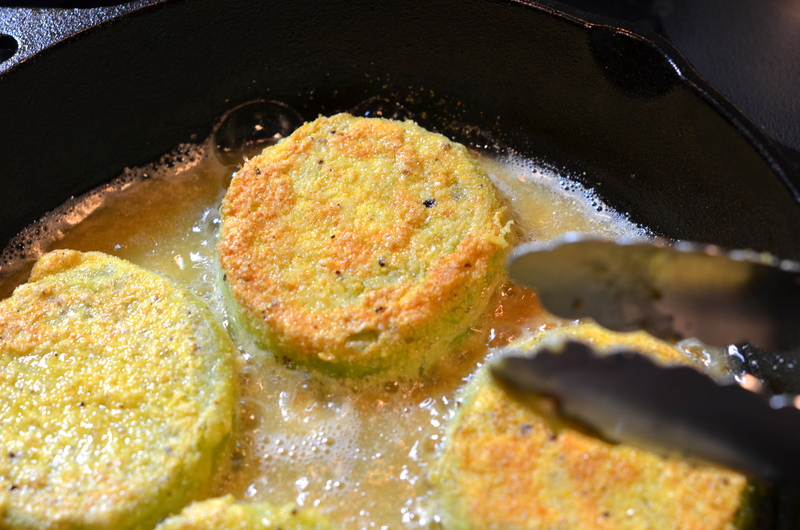 Grab your cast iron skillet or other heavy-bottomed pan and add the oil to about 1/4″. Heat over medium. Take your tomatoes (why don’t you season those too?) 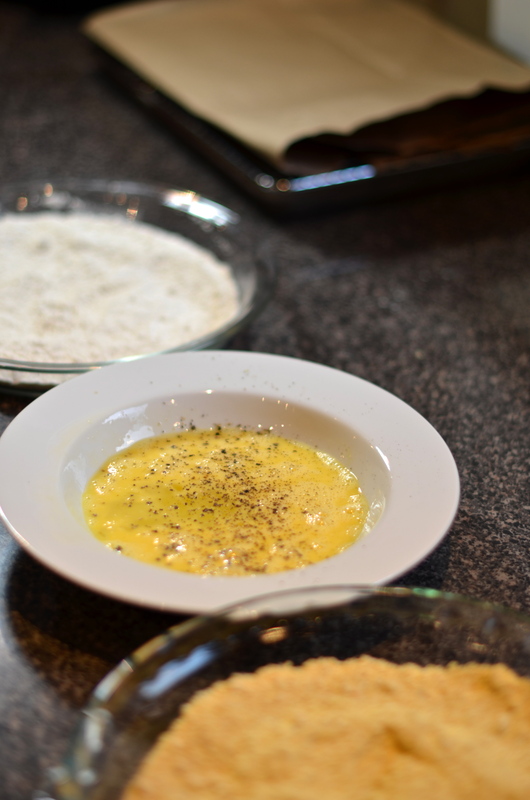 and dredge in flour, then egg, then cornmeal and drop them straight into the hot oil. Cook the tomatoes on each side until brown. If memory serves me, I think that it took about 3-4 minutes per side. The second batch ended up being darker because I didn’t change my oil and it had lots of cornmeal bits in it. No big deal. Pull the tomatoes out and drain them on the paper bag. Now all that’s left to do is to eat the damn things. The husband decided to whip up some remoulade, the official sauce of his family. I just poured some blue cheese dressing on mine. But they’re great without anything on top. Or on a fried green tomato BLT. Make these while you can. The birds and squirrels eat all my tomatoes before they ripen anyway. I suppose the only way I’m going to eat anything from my garden is to eat these green.